After seeing a couple posts at OCN and Koolance own forums about Koolance Quick Disconnect leaking problems...I knew my experience was not isolated. I now have 10 males and 8 female QDC VL3N series quick disconnections used in various applications. The first set I bought about two years ago, the females are still working fine today. However, I recently bought a bunch of new sets, and the new female connectors have all failed. To be clear....the new connectors worked fine for the first few months over dozens of connect/disconnect operations. 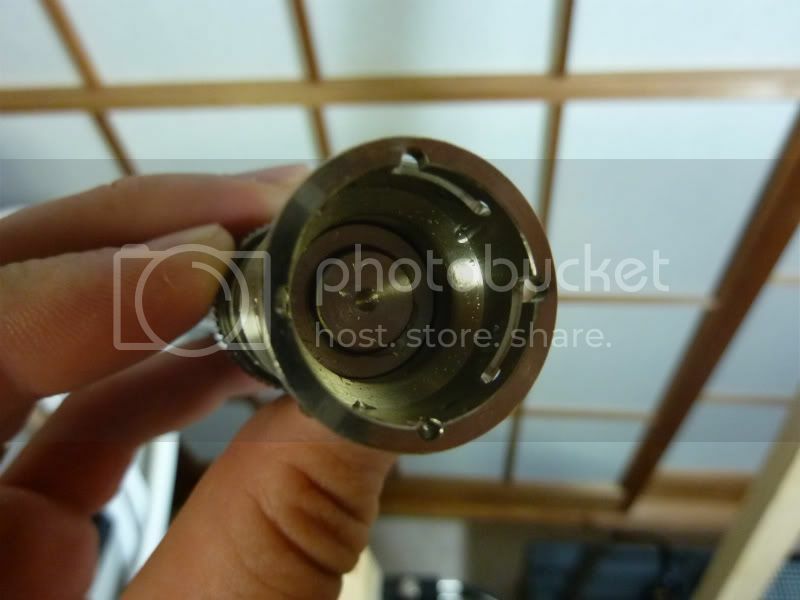 But now, the spring loaded mechanism meant close the valve in the female end no longer closes completely, allowing the connection to drip when disconnected (see the images below). edit - I have verified the problem is not related to low loop pressure. I suspect a minor change in manufacturing that is causing the long term failure of these parts. [url="http://forums.koolance.com/viewtopic.php?f=11&t=1467"]Tim [Koolance] eluded to a change in manufacturing tolerances last year (post #8)[/url]. Here is a shot of my older QDC, both female fittings have been serving me well for about two years now. 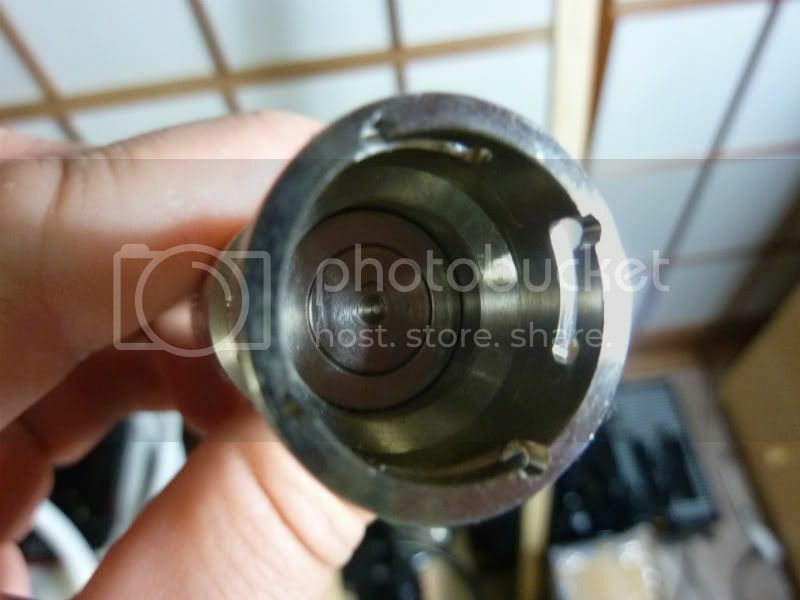 Here is a shot of the newer QDC failing to seal properly....all of my newer female QDC fitting do this consistently now. Also, I need your comments please, let us know if you have older/newer QDC fittings, and whether or not you've seen similar issues. Mine did not do that, all the seals failed on the newer ones, but all the springs still work. There is a pretty decent discussion going at XS with quite a few people sharing their experiences, worth a look if you're interested. I'd really like to here some official comment on the manufacturing changes made. I'm getting ready to revamp my entire cooling system minus the blocks and was considering using the threaded QDC's on all the parts of my loop (rads, res, pump, blocks) to make disassembly, replacement and moving of components easier. Now with this post and a few others I've seen, I'm reconsidering just going with the standard barb fittings. The convenience isn't worth the possible damage to my system. Buzz the compression fittings are far superior to the plain barbed fittings, if you have room for the fittings. I agree with Iz the problem with barbed is if you don't have it tight enough the liquid will get in between the barb and hose, and in time will start leaking and eventually pop off. With compression you will have that tight seal for a long time without any problems. The only thing you will have to keep a steady eye on is the o ring and every once in a while a new seal for the tubing. I'm disappoint Koolance appears to be ignoring this issue. I've now observed this on my male connections as well. Sigh. I was really afraid after reading this. This morning, I had to drain/refill my loops, and guess what? 6 pairs of VL4N, and all have the same leaking problem with the plunger not fully retracting!!! I have 14 pairs of VL3N and they all seems to be ok. But my 6 pairs of VL4N are leaking with the plunger not fully retracting! REALLY annoying. Useless disconnect, since they don't work. I really hope Koolance will do a recall or something. There is something not working with those VL4N. VL3N seems to be ok.
Now I really regret investing money in all those Koolance QDC. I also have this problem on both my females connectors. One leaked within 3 months of use and the second about 10 months later. They really need to look into this. Same issue here. I have 6 VL3N (3 male, 3 female) and the two females that are installed have this issue. The other set is used for draining purposes and have not been hooked up full time.